This resource includes helpful prayers to use in public worship during Lent and Holy week. The collection includes invocations, opening prayers, prayers of confession, and pastoral prayers for the Sundays of Lent, Palm/Passion Sunday, Maundy Thursday, and Good Friday services. 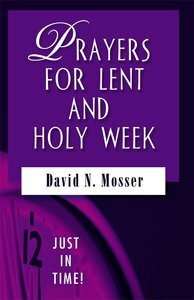 Drawn from a variety of traditions, the prayers in this collection will aid any congregation as it worships throughout the journey of Lent. About "Just in Time! Prayers For Lent and Holy Week (Just In Time Series)"
Ready?? ?to-use biblically based children?? ?s sermons for busy worship leaders. Children?? ?s Sermons Just in Time! offers preachers and worship leaders a ready resource for children?? ?s sermons with stories and object lessons. These children?? ?s sermons are geared to spark interest and attention and teach children about the Christian faith. ??????? ?Let Everything that Breathes Praise the Lord?? ?????? Build up the Body of Christ for Easter??????? ?